Did you know that a Nobel Peace Prize winner has been held under house arrest for 11 years by her government? Did you know this woman is considered a modern day Gandhi? Did you know that Burma (also known as Myanmar), a country where the population is primarily Theravadan Buddhist, is ruled by a military regime? Or is the only thing you know about Burma is that “The Bridge on the River Kwai” was built there? Aung San Suu Kyi is the Asian Nelson Mandela. She has become an international symbol of heroic and peaceful resistance in the face of oppression. Yeah, that’s Jim Carrey in the video, the guy from the movie “Dumb and Dumber” talking about political conditions in Burma, a country on the other side of the world from the USA. He doesn’t sound too dumb. Why am I telling you about Aung San Suu Kyi? Because I believe that we as Americans need to be reminded more than occasionally about what goes on in the rest of the world — and be outraged by it. Like about what’s happening in Tibet and has been happening there since the Chinese marched in. Or about the only Nobel Peace Prize recipient who is imprisoned by her government. Or to be reminded that some of the athletic clothes you buy for your children are made by another mother’s child working a 15 hour shift. Think about your own child working in a sweatshop next time you buy the latest Nikes. Have we become so insular that we are afraid to look beyond our own comfortable backyards? We get our news in nightly soundbites from the talking heads and then move on to the next thing that captures our monkey minds for three seconds. Or are we afraid that if we really investigated and examined what happens in the rest of the world on a daily basis it would be too horrible for us to comprehend? 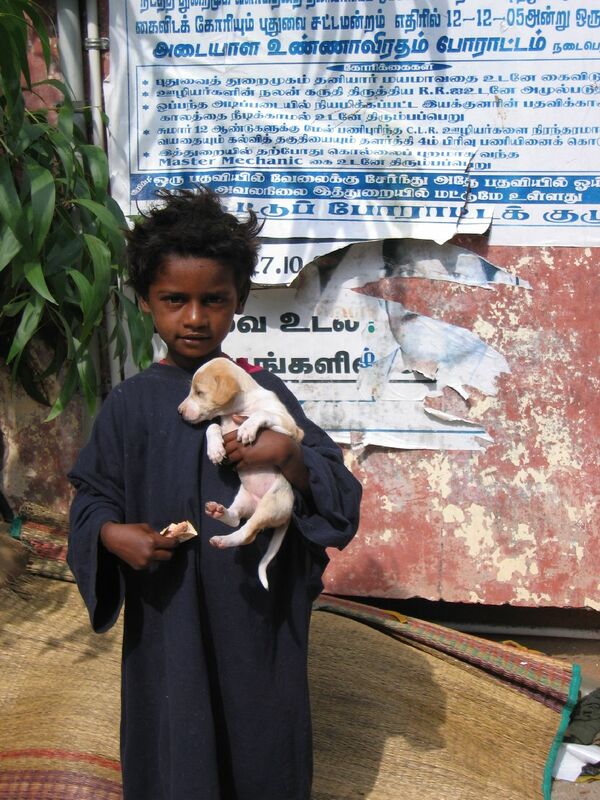 This is a beggar girl and her pup that I ran into in Pondicherry, India. She’s holding the rupees that I gave her. I told her to also feed the pup, but I’m reasonably sure the pup is dead by now, and the girl is still living on the street. It’s just the way it is. Every day. I would rather be poor in America than anywhere else in the world. Next Post a developed nation? One of my favorite quotations is…<><>“Fearlessness may be a gift, but perhaps more precious is the courage acquired through endeavor; courage that comes from cultivating the habit of refusing to let fear dictate one’s actions.” — Aung San Suu Kyi<><>(The person who sent this got it from an article but it spelled her name differently. )This woman and her work are vital and I always want to unite my thoughts and prayers with this kind of light.You have a beautiful blog and I am happy to be here. Peace to all!. thanks! love your blog, too!